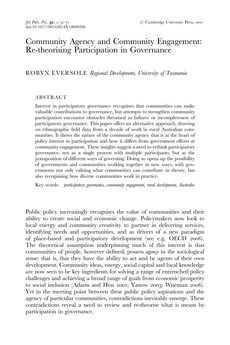 Interest in participatory governance recognises that communities can make valuable contributions to governance, but attempts to strengthen community participation encounter obstacles theorised as failures or incompleteness of participatory governance. This paper offers an alternative approach, drawing on ethnographic field data from a decade of work in rural Australian communities. It shows the nature of the community agency that is at the heart of policy interest in participation and how it differs from government efforts at community engagement. These insights suggest a need to rethink participatory governance, not as a single process with multiple participants, but as the juxtaposition of different ways of governing. Doing so opens up the possibility of governments and communities working together in new ways, with governments not only valuing what communities can contribute in theory, but also recognising how diverse communities work in practice.